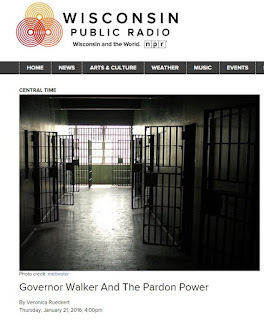 This afternoon, Thursday, January 21, 2016, at 4:00 pm (Central) the Editor of this blog will be a guest on "Central Time," a production of Wisconsin Public Radio. The host, Veronica Rueckert, will focus the discussion on the pardon power and, in particular, Governor Scott Walker's explicit promise not to use it. Prof. Ruckman will explain the constitutional value of pardons, discuss Walker's stance and discuss clemency in relation to the "Making a Murderer" series on Netflix. Callers will be welcomed. Interested readers may tune into the broadcast online here.